This is one of those anime which is mostly nonsensical fun, with a huge emotional undercurrent, some wisdom and common sense sprinkled all over, and just a little bit of fearful tension. 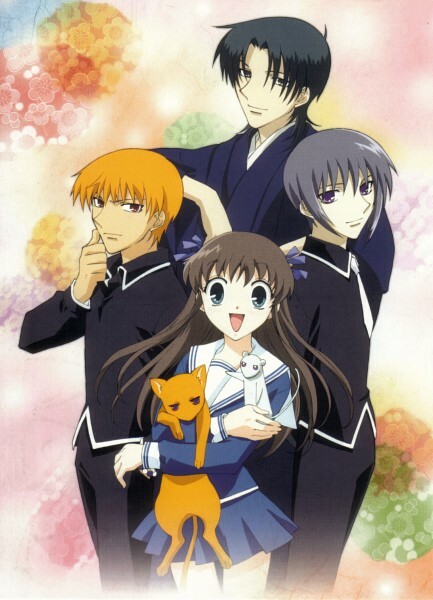 Taking obvious inspiration from the Chinese Zodiac, Fruits Basket follows the experiences of Tohru Honda as she becomes acquainted with the mysterious, illustrious Sohma family. A combination of circumstance and choice aligns almost like fate to bring her into contact with a branch of the Sohma household, who charitably take her under their roof, and avoid making her indebted to them by making it an exchange, where she does housework for them. It does not take long for Tohru to literally stumble onto their secret: the Sohma family is cursed. Some of them turn into an animal from the Zodiac when hugged or otherwise held by someone of the opposite gender. Which is certainly hilarious at times, but is also a terrible, heart-breaking burden. Now, while most of that remains the same between the anime and the manga, from what I’ve heard, there’s a particular difference. In the manga, it’s possible for the curse to be broken, and this is the key to the overarching story, specifically why the central love story is so important, because that is how the curse is finally broken. In the anime, there’s not much of a story at all. It’s more a chronological series of short stories building on each other, rather than a single story stretching across the series. There’s a small, somewhat convoluted culmination towards the end, but nothing really changes, nothing is actually resolved. Normally that would irritate me to no end, as there are few things I dislike more than unfinished stories. In the case of Fruits Basket, however, it’s more of a minor annoyance. I can see why they had to make alterations, as the manga ran until 2006, while the anime came out back in 2001, a scant three years into its run, but even ignoring that, it still doesn’t bother me. Perhaps that has something to do with the subject matter. As serious as a lot of the anime really is, it’s still difficult to take it seriously. You have plenty of drama to choose from, including an entire family suffering under a terrible curse, the many losses they’ve suffered for it, a pair of brothers trying to bridge the gap between them, and most especially the developing bond between rivals who are really best friends and the potential of a love triangle (not to mention Tohru still reeling from the recent loss of her mother). Still, with all of that, it’s the comedy that really sells the show for me. So, the heavy drama of the conclusion, lack of resolution included, is difficult for me to take at face value. Speaking of the comedy, that is entirely due to the characters and their interactions with each other. Tohru is a quintessentially sweet girl, hard-working and selfless to a fault, always trying not to be a burden on others, even at the expense of her own feelings, yet often possessing a remarkable wisdom which she gained from her late mother. Fortunately, she has people around her who will stand ground in her place if need be, including her dear friends at school, a semi-delinquent girl and a semi-gothic girl, as well as several members of the Sohma family. In the latter case, Kyo and Yuki are her closest friends, representing the apocryphal cat and the rat, respectively, a study in contrasts, always arguing, yet oddly respectful towards each other. Most of the other Sohmas are friendly to her as well, and exhibit a range of mental and emotional states, ranging from the obsessive, to the cute, to the melodramatic, to the stoic. They’re an amusing family, that’s for sure! It would be so easy for these people to have succumbed to bitterness and anger, but instead they generally endure their curse with dignity and grace, personality quirks notwithstanding. There is only one really malicious Sohma in the family, but this one happens to be head of the family. So, guess who the villain of the story is (for the whole two minutes when the story actually needs a villain). Obviously, this show would not work without some pretty good voice work, and Funimation’s dub delivered on that wonderfully. Many technical aspects of the show might feel a little “dated,” in terms of animation style and quality, and the music isn’t anything remarkable (though the “quaint” feeling of it rather fits the show), but the dubbing is still top notch, I think. (yes, the original Japanese dub is also plenty good, but I’ve mostly watched in in English, so…) Heh, I still get a kick out of Ayame, the very effeminate snake and Yuki’s brother, being voiced by the same guy who voiced Piccolo in Dragonball Z.
I do wonder a little about the content of the manga. I know it’s all clean and decent and such, but as the main thrust of the story becomes the romantic entanglements of various characters, I do wonder about the reasoning behind pairing both of Tohru’s best friends up with men who are substantially older than themselves right out of high school. But I suppose that’s neither here nor there. In summary, if you’re looking for some laughter and maybe a few tears, Fruits Basket is probably for you. It makes me laugh so much that, whatever qualms I might have, it remains one of my favorites. It’s generally so lighthearted you can’t help but love it, the serious moments really are quite tender, the characters are hilarious and fantastic, and it’s fairly well-crafted. I highly recommend it. Rating: 9 stars out of 10. This entry was posted in Anime and Cartoons, Tuesday Review and tagged Fruits Basket. Bookmark the permalink. Fruits Basket was one of the very first shoujo manga I’ve read and Mer-san your review explains the story perfectly! I really enjoyed Fruits Basket and did read some of the manga to find out a few more answers about a couple of characters. Once I satisfied my curiosity I moved on, but I’d love to see the anime rebooted and the story concluded in anime form. Yeah, I think I’d like that too, seeing the happy ending for Tohru and Kyo, and the Sohmas. Tohru made thisanime special for me. She always knew what to say to someone, and it’s her understanding personality that wins every member of the Souma family. That is true about the OP. If not for a funeral, it was at least pretty boring. Like, “I am enjoying this show so much! Let’s go to the next epis-ZZZZZZZZZZZZZ!!! !” levels of boring. so true. to this day, i’m perplexed by it.